The type 'MyNamespace.DataClasses.SomeClass' already contains a definition for 'Item'. That’s very useful to know. I don’t know if I’d be able to find the source of an error like that, would you mind elaborating on how you debugged this? Thanks for sharing in any case =). odecey: Just look at the compiled code in the reflector, is ildasm it. You can see what voodoo the compiler do do. 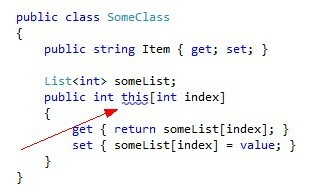 To compound the error further, create a class with the name of Item – without the attribute you can’t create any indexers at all! This is one of the best articles I read online. No crap, just useful information. Very well presented. I have found another nice post over internet related to this post. You may check it by visiting following link..